LeanCBSE.in provides Class 11 Maths NCERT Solutions for Free. We have completely solved each question in NCERT (National Council of Education Research) textbook of Class 11 mathematics. NCERT Textbooks are widely used by schools following CBSE. NCERT solutions for class 11 maths covers exercises given in Sets, Relations and Functions, Trigonometric Functions, Principle of Mathematical Induction, Complex Numbers and Quadratic Equations, Linear Inequalities,Permutation and Combinations, Binomial Theorem, Sequences and Series,Straight Lines, Conic Sections, Introduction to Three Dimensional Geometry, Limits and Derivatives,Mathematical Reasoning. LearnCBSE.in provides easy and quick access of chapter-wise questions and answers in a single page. 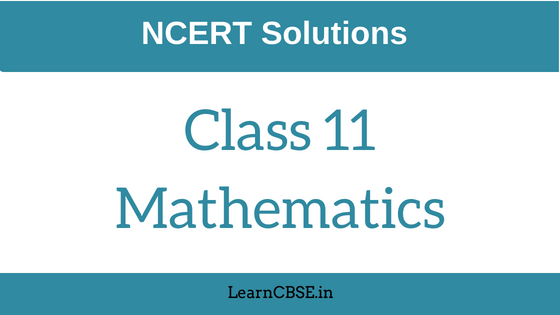 Step by Step solutions for all 16 Chapters in NCERT Class 11 Maths Textbook.